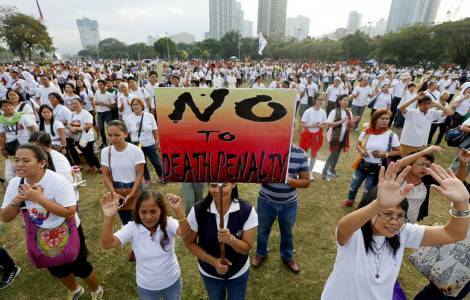 Manila (Agenzia Fides) - Today, May 19, the "March for Life" reached Manila, to say "no" to the death penalty, a caravan of pilgrims who left from Midanao (Southern Philippines) on May 6, along a route that crossed the entire archipelago. Among Catholics, priests and religious faithful, members of civil society organizations, also Fr. Edwin Gariguez, executive secretary of the "National Secretariat for Social Action", organ of the Episcopal Conference of the Philippines, took part in the march, who officially praised the initiative. The marchers will present a petition to the Philippine Senate on May 24, inviting senators to reject the death penalty, a measure promoted by President Rodrigo Duterte and approved two months ago. "The death penalty will only punish the poor, who cannot afford lawyers, and many innocents", says the text of the petition sent to Agenzia Fides. The text notes that "capital punishment is illegal as it would violate the existing international treaties, of which the Philippine Government is a signatory". The adoption of capital punishment, it says, will also have economic repercussions, since "the European Union will impose a tax on 6,000 products imported from the Philippines", especially agricultural and fishery products. "Let us pray for our senators to decide on the basis of conscience and reason by rejecting the death penalty", said the marchers who on May 21 will join thousands of people for a Mass presided by Cardinal Luis Antonio Tagle at the University of Santo Tomas in Manila.